This area is popular with families and children because of the famous climbing sculptures, the story-telling programs, the model boats, the cafe, and the site in the children's classic Stuart Little. An ornamental pond was constructed as a reflecting pool for a glass conservatory, but when the plan for a structure was abandoned, the water body became the popular model boat pond, inspired by those in Parisian parks. From April through October, children and boat enthusiasts come to navigate radio and wind-powered vessels across the shimmering waters. It's such a popular destination that writer E.B. White set the whimsical boat scene in his children's classic, Stuart Little, here. It was recreated in the 1999 film of the same name. Just east of the pond, visitors can rent a model boat or eat at the outdoor tables of the Kerbs Memorial Boathouse. 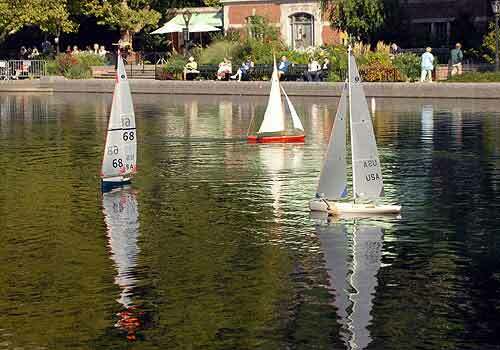 Conservatory Water provides a serene background for a host of other activities. In the coldest winter months, the pond's water level is frequently lowered for free public ice skating. In the summer, the beloved Hans Christian Andersen statue west of the pond is home to a children's storytelling series. Birders also flock to the area, binoculars in hand, searching for signs of the famed red-tailed hawks of Fifth Avenue. In 1993, the Central Park Conservancy refurbished the Boathouse's terrace, incorporating the benches and planting beds you see today. The Conservancy later restored the pond, replacing the concrete stone with durable and attractive granite.